The lovely Emma & Dan contacted me earlier this year while they were back in the UK visiting family & friends and organising their wedding. Dan is Australian and Emma is British, they met in the UK working for a catering company but now live in Australia. 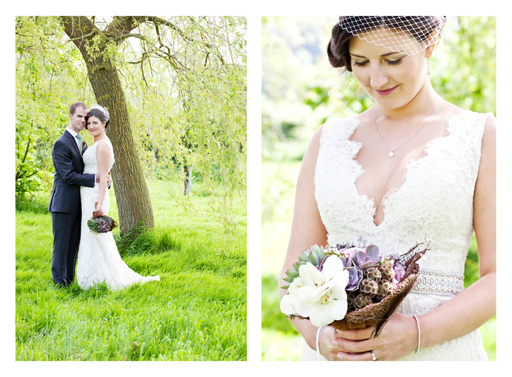 It was a lovely sunny day at Tithe Barn in Petersfield, Hampshire. Emma looked breathtaking in her fitted lace dress & bird cage veil. The two beautiful bridesmaids wore sage green flowing floor length dresses. Dan and his Best-men (his two brothers) looked very dapper in their suits with coordinating ties. The wedding was simply beautiful, a lovely couple, gorgeous venue, stunning flowers, beautiful clothes & fab styling by the bride.